Professional Sports Catering is a full service food and beverage company that focuses exclusively on minor league baseball. As background, in 1996, Tom Dickson and Sherrie Myers opened their first ballpark in Lansing, Michigan, and hired one of the “big” food and beverage companies to run the food operation for the Lansing Lugnuts. They were not happy from day one. Despite attendance of over 500,000, the Lugnuts’ operation was small potatoes to the food service provider. There was little communication throughout the process, and the customer service and product quality did not meet the expectations of the fans. After five years, Tom and Sherrie took the operation over themselves. Despite a few growing pains, food per caps increased over thirty percent in the first year. The food was better, customer service improved, and the bottom line was fatter. In 2005, Tom and Sherrie decided to bring what they had learned about the minor league food business to other teams and PSC was born. Professional Sports Catering was launched to serve the needs of minor league baseball clubs who don’t want to run their own food business but want someone to do so that shares their core values: taking care of their customers, providing exciting and fresh food and beverage products and making a fair profit. In 2014, PSC announced a partnership with Levy, one of the premier event and hospitality groups in the world. 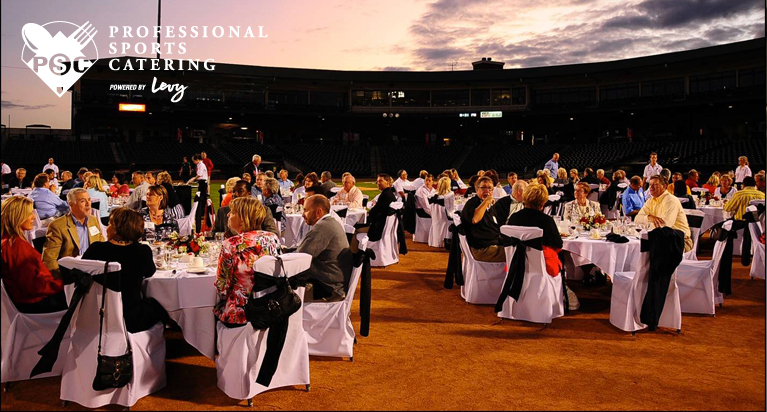 As the minor league and spring training division of Levy, we marry the creativity and knowledge of the MiLB experts with the resources and innovation of the premier restaurant group in the world, PSC now provides its partners with a combination that is unmatched. As a result, PSC is the fastest growing concessionaire in baseball and has become the preferred partner in minor league baseball, operating at over 30 ballparks around the country. Through our branded concepts, customer-friendly approach, and the power of Levy, we continue to bring innovative ideas that enhance fan experience and increase revenue.